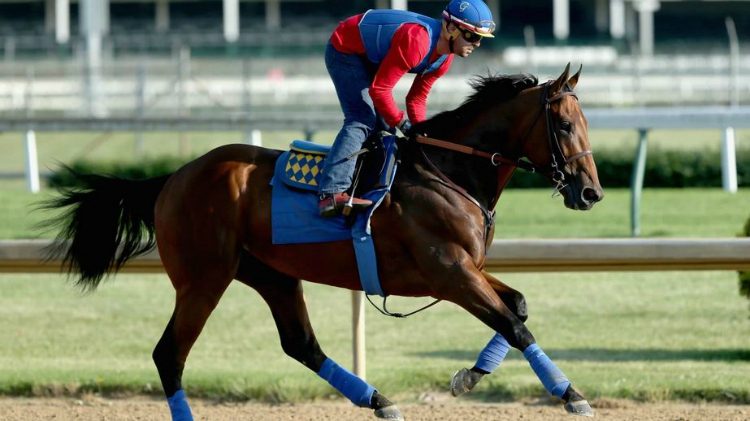 After the running of the Kentucky Derby and the running of the Preakness Stakes comes the running of the Belmont Stakes, the final jewel in horse racing's Triple Crown. The Belmont Stakes is the oldest and longest of the three classic horse races, with the Kentucky Derby and the Preakness Stakes, that constitute the Triple Crown of American horse racing. The Belmont has come to be known as the “Test of the Champion” by horse racing professionals. By the time the race is run, the three-year-old Thoroughbred horses that compete in it have fully matured, and the field of competitors has been weeded out so that only the very best of the crop compete, which is why the field is usually the smallest of the three Triple Crown races. The Belmont has been run at various distances and tracks in its history. It has been held at Belmont Park, near New York City, and the course has been 1.5 miles (about 2,400 metres) in length since 1926. The race is held early in June and is the final race of the Triple Crown. Belmont Park is home of the Belmont Stakes, the final jewel of the Triple Crown races. The park has the largest dirt racecourse of any thoroughbred track not only in North America but the world at a mile and a half (2414 m). A 430-acre racetrack in Elmont, New York, Belmont Park has two race meetings scheduled annually. It is also was the site of the 22nd running of the Breeders' Cup World Thoroughbred Championships on October 29, 2005. Belmont Stakes has been named the "Run for the Carnations" due to the blanket of white carnation flowers that are draped over the winner's neck. The qualification is 3-year olds and the weight is a Colt/Gelding 126 lbs. and Filly is 121 lbs. The purse for the Belmont Stakes is $1 million.